Many would agree our recent elections have revealed deep and troubling divides in our country. Though there are certainly several contributing factors some have framed and perhaps foretold this as part of a larger global populist wave rejecting what many perceive as elitist experts and technocrats out of touch with the values and needs of ordinary citizens. For those who seek to support evidence based decision making contributing to the long term well-being of society this presents a fundamental and possibly existential challenge. This is particularly true for our publicly accountable Land Grant system, requiring us to more critically reflect on how our research, learning and outreach mission and theory of change can be more responsive to the perceptions, motivations and lived reality of communities we serve. So the Expert Authority brands need to change their tone, their message, and their proof points. They have to be less patrician, and more persuasive. They need a new style of leadership. I suggest that subtle, nudging ‘leadership by partnership’ is the right tone. This idea of leadership by partnership is certainly not new to many of us working within the Land Grant system, particularly within Cooperative Extension. Our own Extension system at Cornell states as much in its mission, declaring “We bring local experience and research based solutions together”. Yet as I highlighted in a previous post many have concerns about system rigging similar to those raised in our election, seeing our Land Grant system as favoring certain classes of individuals and interests1. In fact for quite some time many have been calling for more collaborative connections between our on and off campus communities. Between January 1996 and March 2000 the Kellogg Commission on the Future of State and Land-Grant Universities held numerous meetings and produced six reports to build awareness among public universities of the need for higher education reform. A 1999 report, Returning to our roots: The engaged institution (Kellogg Commission, 1999) called for Land Grant Universities to move beyond a one-way transfer of information and technology to communities and be more “sympathetically and productively involved with their communities” (emphasis added). Since that time concerns have continued to be voiced from both within and outside of Land Grant institutions regarding their ability to fulfill their knowledge with a public purpose mission. Several have suggested that practitioners and public stakeholders must be more actively engaged in the knowledge co-creation process, with Land Grant institutions reducing their emphasis on prescriptive recommendations and embracing a more facilitative or catalytic development model better leveraging local resources and networks in support of local solutions. Those voices have been perhaps most loud within the context of agrifood systems efforts seeking to address concerns around economic equity, social justice and inclusion, and environmental sustainability, with some suggesting we become “leaderful catalysts for change” (Colasanti, Wright, & Reau, 2009). There is vigorous reciprocity in the Extension Service because it is with the people, as well as “of the people, by the people, and for the people.” It not only carries knowledge from the State Colleges to the people, but it also works in reverse: it carries from the people to their State Colleges practical knowledge whose workability has been tested on farms, in industry, in homes, and in communities…Mutual benefits result for the people and for the educational institutions they support. Cooperative Extension [should provide] leadership in… creating space and building the trust needed for interfacing academic and non-academic forms of human knowledge. Trust-building, deep listening, cognitive frame-shifting, open-mindedness, fair-mindedness, self-reflective and critical thinking [are] key skills and dispositions in learning from community how to navigate the sometimes challenging cultural terrain and complex knowledge commons. New communications technologies coupled with the emergence of societal networking and community-focused action groups will continue to erode the monopoly universities hold on advanced learning… universities must adapt quickly if they are to thrive in a world of rapid, interactive information flow… The pattern of increasing competition, public distrust, and declining support is likely to continue unless a new defining vision for public universities emerges… The next phase in the development of the public university will be a community-focused learning network that extends access to all citizens through university outreach and online instruction in the communiversity of the 21st century… public universities able to build on the land grant ideal, re-engage with the larger community, and take advantage of communications and societal networking technologies will thrive in the 21st century. My own work has been inspired by these and similar calls to action in the library world, including R. David Lankes’ vision of libraries as platforms helping unlock the potential of our communities, supporting knowledge creation through conversation in those communities. As an Outreach and Engagement Specialist at Mann Library for many years I brought on and off campus communities together for such conversations through a wide range of collaborative programming including an award winning Connected Minds, Resilient Communities series. I’ve also contributed to and helped catalyze a variety of capacity building efforts with civic/non-profit groups engaged in agriculture and food systems work. Central to LCW’s theory of change is creating a new “environment of connectivity” where residents can more easily connect to information, opportunity and each other. One of the challenges I’ve had in applying this to my boundary spanning work with those outside of the library is building understanding and active ongoing support for what knowledge management specialists recognize as a sociotechnical systems approach. Some of these difficulties are associated with linking relatively narrow, shorter term outcomes/logic models of resource constrained programs and organizations with longer term systemic change efforts, justifying investments in shared infrastructure supporting both including collaborative platforms. Growing interest in Collective Impact approaches from many of the groups I work with has helped make the case for this work. First popularized by John Kania and Mark Kramer in their 2011 Stanford Social Innovation Review article, Collective Impact approaches seek to realize large scale social change through broad cross-sector coordination. Its worth noting how these efforts deal with the issue of expertise mentioned in the beginning of this post: complementing the insight of subject experts, Collective Impact initiatives also include “context experts” with lived experience relevant to the issue they are seeking to address. Kania and Kramer suggest five conditions that together produced greater alignment and collective impact: a common agenda, shared measurement systems, mutually reinforcing activities, continuous communication, and supporting and connecting the others, backbone support. Information and communications systems are an important part of the backbone support role. 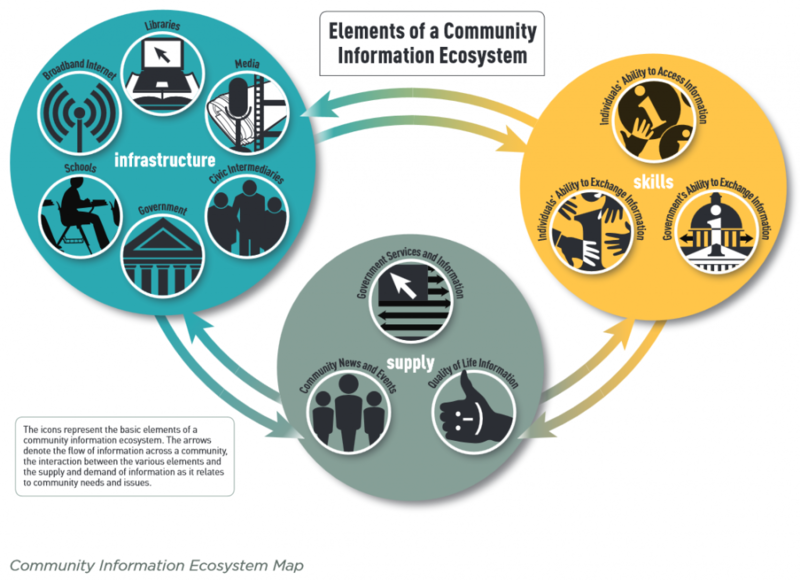 Resources like the Knight Foundation and Monitor Institute Community Information Toolkit and their advocacy for building stronger communities through information exchange via “Community Information Ecosystems” have also helped make the case for such infrastructure needs. In my work with agriculture and food systems initiatives I’ve extended this ecosystem model as part of necessary code-switching away from technical language toward more earth-based, biologically oriented metaphors. One I’ve had the most success with is equating these systems to what Paul Stamets has called the “Earth’s natural internet“: mycelium, underground fungal networks supporting the exchange of nutrients and “information” (e.g. communicating to neighbors that pests may be in the area, signaling a chemical defense response) via mutually-beneficial mycorrhizal partnerships with (and between) around 90% of land based plants. That includes their role in supporting healthy resilient agroecosystems as “agro-ecosystem engineers” (Cameron, 2010). Some have used this metaphor in suggesting a move away from higher commitment membership based communities of practice (Engeström, 2007) toward more loosely bounded mycorrhizal learning networks, echoing Traynor’s call for a shift away from membership focused movements. I’ve found this metaphor useful in international contexts as well, most recently favored by colleagues in Australia. After several of them attended a presentation of mine at the 2014 National eXtension Conference in Sacramento I was invited there this spring, as a Visiting Fellow hosted by the State of Victoria’s Agriculture and Rural Division. There was interest in how they might apply these networked approaches in their own knowledge management work. Lacking an Extension system as we know it2 they are looking for ways they can still “collaborate across institutional and jurisdictional boundaries, enabling the emergence of a national innovation system through public knowledge management” (Vines, Jones, & McCarthy, 2015). While there I was able to learn about interesting work being done across the state, including the Birchip Cropping Group, an innovative farmer-based RD&E entity, as well as eXtension type approaches being explored in Australia. After returning to the U.S. I co-presented with one of my Australian colleagues Richard Vines at the National eXtension conference in San Antonio and continue to draw from this fertile and collaborative exchange in my current eXtension sponsored Land Grant Informatics fellowship3 (which this blog series is a part of). Of course none of this capacity building work happens in a vacuum. Personal and organizational capabilities, perceptions, biases and motivations play an important role in shaping these socio-technical “environments of connectivity”, how or whether they are utilized (for good or otherwise), and whether they represent a level playing field. I touched on some of those issues in my last post, including various forms of bias at the individual, organizational and systemic level, and how the principles of self-affirmation theory should be recognized in addressing those. Self-determination theory (SDT) also tells us there are three innate universal human drives: the need for autonomy, competence, and relatedness. Daniel Pink’s book Drive adapted research from this for the business world following similar themes, autonomy, mastery, and purpose, while lacking an emphasis on relatedness. SDT holds that we are most deeply engaged and do our most creative work when we feel that we’re acting according to our own will on goals we find meaningful. When all these are experienced, through our “inherent growth tendencies” nurtured in part through social environments, there are positive consequence (e.g. well-being, growth and innovation). Working Out Loud offers one way of expressing those growth tendencies. Many of the initiatives I and my Community, Local and Regional Food Systems CoP cohorts work on or with are clear expressions of these as well. These are framed internally and externally in various ways, using terms like Collective Impact, civic agriculture, food security and food sovereignty, often concerned with cultivating not just food but valuable assets like self-efficacy and social capital. Yet when these universal drives are thwarted, potentially by a variety of factors including some outside of one’s individual control, there are negative consequences. Reading Chris Arnade’s recent article in the Guardian it’s easy to see that many who voted in the recent election are behaving in accordance with the principles of both self-affirmation and self-determination theory. This suggests some critically important work to be done by those of us dedicated to public service. As Harold Jarche often articulates, networked approaches can support self-determination, at work and beyond. 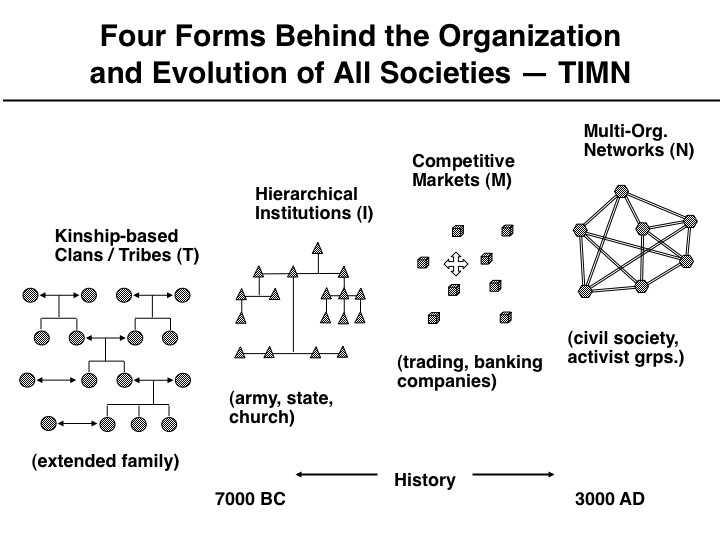 That includes (drawing in part on David Ronfeldt’s Tribes-Institutions-Markets-Networks Theory illustrated below) networks as an evolutionary step of societal organization. According to Ronfeldt all four of these forms can (and ideally should) co-exist as we enter the next evolution of society, but networks will dominate. Yet each form is ethically neutral, and can be used for good or ill. So for example, the tribal form, which can co-exist with the network form, can foster communal solidarity and mutual caring, as well as narrow, bitter clannishness. The Net lowers the barriers to encountering and interacting with that which is different. The barriers that remain are not technology’s but our own. We have lost every excuse not to embrace difference… Perhaps our hyperlinked infrastructure will give us a self-understanding that makes it easier for our curiosity and compassion to overcome our self-centered fears. If we’re going to address increasingly wicked and interwoven problems like climate change, food security and growing wealth inequality I believe Cooperative Extension and the Land Grant system as a whole must more fully acknowledge the increasingly networked nature of our world, and both the challenges and opportunities that presents. In my next post I’ll share some specific findings and recommendations for how we might enhance our “socio-technical capabilities” in support of such network-centric approaches to realizing healthy people, farms, communities and food systems, by reimagining our Land Grant system as a networked knowledge commons. In the meantime, those who would like to learn more about how these approaches can be applied to food systems work can check out the North American Food Systems Network (NAFSN) Good Food Talk webinar led by Curtis Ogden Nov. 16th, on Collaborative Pathways to Change: Tools for Just and Sustainable Food Systems Networks4, as well as past webinars on their website. And as always, comments and feedback always appreciated here or offline. In its report Public Research, Private Gain: Corporate Influence Over University Agriculture (Food and Water Watch, 2012) the Food & Water Watch calls attention to how the funder effect can corrupt the public research mission of Land Grant universities, inhibiting their ability to effectively and equitably help farmers improve their practices and livelihoods. For a historical overview of Extension in Australia, I refer you to Warren Hunt, Colin Birch , Jeff Coutts & Frank Vanclay’s 2012 paper, The Many Turnings of Agricultural Extension in Australia, The Journal of Agricultural Education and Extension, 18:1, 9-26, DOI: 10.1080/1389224X.2012.638780. Some might find their perspectives on cyclical change (reminiscent of a panarchical view) useful in seeing our own CES in a historical light. They frame historical changes in terms of four reoccurring cyclical “turnings”: crises, highs, awakenings and unravelling. Perhaps relevant to current conditions, Unravelling, a downcast period of weakening institutions as older orders decay, is followed by Crisis, a decisive period of upheaval, where a sense of urgency drives deep institutional transition. This Solving for Pattern series represents one effort to learn and work out loud as I pursue an eXtension supported “Land Grant Informatics” fellowship, exploring ways we might more effectively link people, technology and information in support of our Land Grant mission and communities we serve. The eXtension Community, Local, and Regional Food Systems CoP is partnering with NAFSN on a Food Systems Development Certificate, and my hope is we can work with experts like June Holley and Curtis Ogden on developing a network literacy and leadership competency framework as a part of that. Kellogg Commission on the Future of State and Land-Grant Universities., & National Association of State Universities and Land-Grant Colleges. (1999). 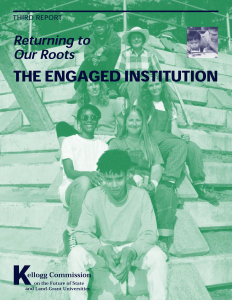 Returning to our roots : the engaged institution. Washington, D.C.: National Association of State Universities and Land-Grant Colleges, Office of Public Affairs. http://www.aplu.org/library/returning-to-our-roots-the-engaged-institution.